… Illegal aliens commit crimes by illegal entry, re-entry, and overstay. Their very first act, illegal entry, is a crime, demonstrating contempt for U.S. law. Overstay and illegal presence are not themselves crimes (they should be: they are civil offenses against the law), but failure to register is a crime. Nearly every illegal alien commits these crimes daily along with a daily cascade of other crimes related to identity. They use false/forged/stolen ID, such as Social Security numbers, resident alien cards, and drivers licenses. Many use criminal organizations to enter the U.S., or to obtain their false IDs. They swear falsely and present false documents on I-9 forms required for employment. They work and drive without required licenses, bonding and insurance. They use false Social Security and ITIN numbers on tax returns, claim dependents and benefits to which they are not entitled (e.g. Earned Income Credits). Much of this is done with the aid of U.S. employers, government agencies (sanctuary jurisdictions), and privacy laws. Being here illegally, they use (steal) benefits to which they are not entitled, including education, welfare, and medical benefits to the tune of billions of dollars. Their children, born here, consume billions of dollars and overwhelm public services such as education. They earn billions of dollars which, while not paying taxes, they remit to their home countries. Illegal aliens commit disproportionately more crimes, violent and otherwise, than others in America. This is immediately obvious from the first assertion above: most Americans are not committing a cascade of crimes on a daily basis. However, illegal aliens are disproportionately present, convicted, in federal and state prisons, and on Most-Wanted lists. John Lott’s 2018 study of Arizona convicts, based upon actual convict convictions, confirms this ("Based on data from 1985 to 2017, undocumented immigrants are at least 146% more likely to be convicted of crime than other Arizonans”), as do U.S. General Accountability Office and U.S. Sentencing Commission reports for federal prisons. We have the federal E-Verify Program so that employers can determine who has valid Social Security numbers and legal right to work. E-Verify should be mandatory, and meanwhile all employers should voluntarily use it. I am sad and angry that Americans buy illegal drugs: Mexicans could not sell if Americans did not buy. In that sense, such Americans are deeply complicit not only in the harm done to the U.S., but also the harm done to Mexico in the drug wars, corruption, and murders in Mexico, and in the narco-corruption pervasive in that country. That, however, does not excuse Mexico, and does not justify its use of America to relief for its unemployment, and as a major source of national income through remittances. I am sad and angry that Americans participate in the massive lawbreaking which illegal immigration requires. We could do this legally, morally, openly and honestly. Read the Fall, 2018 Social Contract Journal online, or obtain a printed copy. In a recent newsletter, NumbersUSA lists all the steps that Attorney General Jeff Sessions has taken to turn our muddled immigration system around and make it work again for the best interests of U.S. citizens. Of course, a lot remains to be done, and any progress at all depends on elected officials in Congress and The White House. President Trump criticizes his AG at times, but looking at what Jeff Sessions has accomplished, Sessions deserves citizens’ praise and encouragement. Let’s hope Mr. Sessions gets strong support from the public, the Department of Justice, and elsewhere in government. No person in the Administration has done more to advance Pres. Trump's immigration agenda than Attorney General Jeff Sessions. Here's an overview of some of the areas in which AG Sessions has taken bold action over the last 21 months. END DACA -- AG Sessions authored the legal defense for the Trump Administration's decision to end the illegal DACA executive amnesty. The Department of Justice has also defended the decision to end DACA in a number of legal challenges filed by several states and pro-amnesty groups. END SANCTUARY CITIES -- AG Sessions has taken several actions to discourage states and local jurisdictions from providing sanctuary to illegal aliens. He's blocked Department of Justice grants for sanctuary jurisdictions and sued the state of California over the state's passage and implementation of laws that block both law enforcement and employers from working with federal immigration officers. AG Sessions has also supported a Texas state lawsuit that seeks to eliminate sanctuary jurisdictions in the Lone Star state. REDUCE ASYLUM FRAUD -- Earlier this year, AG Sessions took action to reduce the growing number of illegal border crossers who exploit the asylum system to avoid prosecution for illegal entry. He strengthened the credible fear standard by clarifying that the law does not allow individuals to receive asylum for fear of gang violence or domestic abuse perpetrated by non-governmental actors. He ruled that credible fear claims should only be approved when the alien has a well-founded fear of persecution in their home country because of their race, religion, nationality, political opinion, or membership in a particular social group. This single action should help reverse the dramatic rise of defensive asylum claims entered by illegal aliens over the last decade. INCREASE IMMIGRATION JUDGES -- AG Sessions has taken steps to eliminate the enormous backlog of cases that are bogging down the immigration courts. Just last week, AG Sessions announced that the DOJ would be increasing the number of immigration judges by 50% to help deal with the more than 746,000 immigration cases that await a ruling. This major new expansion would be on top of the additional judges AG Sessions sent to the Southern border region earlier this year to help deal with the ongoing border surge. He's also issued new guidelines to immigration judges to ensure the fair and expeditious treatment of cases and placed limits on judges' ability to postpone hearings that allow illegal aliens to live and work in the United States. ZERO-TOLERANCE POLICY -- AG Sessions issued a zero-tolerance policy for illegal border crossers, ordering the prosecution of all foreign nationals apprehended crossing the border illegally. The policy also covers illegal aliens who enter a defensive claim for asylum -- approximately 80% of illegal border crossers from Central America who claim asylum have their claims eventually denied. In his State of the Union speech earlier this year, Pres. Trump said "Struggling communities, especially immigrant communities, will be helped by immigration policies that focus on the best interests of American workers and American families." It's clear that Attorney General Jeff Sessions has done more to implement those policies than any other individual in the Trump Administration. We encourage you to call the White House comments line at (202) 456-1111 and tell Pres. Trump that you stand with Attorney General Sessions and support the actions he's taken to return America's immigration system back to one that serves the national interest. Today, the Repeal Oregon Sanctuary Law Committee announces that it has submitted to the Oregon Secretary of State the signatures needed to likely qualify Initiative Petition 22 as a measure on the November 2018 statewide ballot. The measure will give voters the opportunity to overturn Oregon Revised Statute 181A.820, the state's illegal-immigrant de facto sanctuary law. Oregon State Representatives Esquivel, Barreto and Nearman are Chief Petitioners of the initiative and Cynthia Kendoll is authorized agent and President of Oregonians for Immigration Reform, which spearheaded the signature-gathering effort. "This afternoon, our committee took a huge step toward repealing Oregon's sanctuary statute and thereby freeing our police and sheriffs to cooperate more easily with federal immigration authorities enforcing U.S. immigration law," said Kendoll. "Today was the culmination of a year-long volunteer effort. Across the state, hundreds of grassroots Oregonians worked to garner the signatures of tens of thousands of voters. All are eager to end Oregon's sanctuary policies that shield people, even criminal aliens, in our country illegally and to see their state do its part to combat illegal immigration." "Lately, a tiny, but loud, minority of open-borders radicals have grabbed the media's attention with unruly, disruptive street demonstrations," added OFIR Communications Director Jim Ludwick. "This November, Oregonians who support the rule of law will demonstrate too -- not with noise, disruptions and threats, but with their votes, via Oregon's fair, orderly system of direct democracy. And we're confident they'll choose to repeal the state's dangerous sanctuary law." Oregonians for Immigration Reform, founded in 2000, engages voters and representatives at all levels of government for immigration policies that serve the interests of U.S. citizens, including an end to illegal immigration and reductions in legal immigration to more sustainable levels. In 2014, the group spearheaded Ballot Measure 88 through which Oregon voters rejected illegal-immigrant driving privileges. This Friday, July 6, (8 am to noon), OFIR will have a signature drop-off site on the steps of the State Capitol building in Salem, to allow persons who haven’t already sent in their signature sheets to get them in. Look for the American flags honoring all those who have collected signatures. When IP 22 is qualified for the November ballot, Oregon will be the only state to have the opportunity to end their state’s sanctuary policies that shield criminal aliens. As the number of signatures required was 88,184, OFIR has likely succeeded in the signature-gathering phase of their herculean task and must now embark on "making the sale" on IP 22 to all of the state's voters. But the OFIR-ites won't be certain of this first-step success until the Secretary of State has confirmed that enough of the signatures gathered are valid. On July 8th, I spoke by phone with OFIR Communications Director (and founding President) Jim Ludwick, whom I have known for several years. 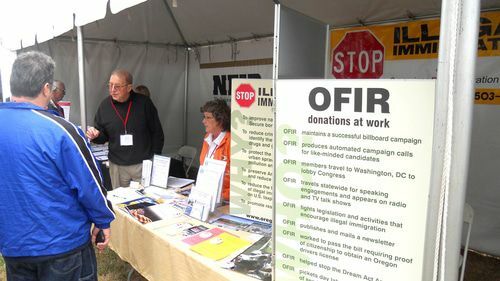 Jim, who is also a veteran of OFIR's triumphant 2013 - 2014 "NO on 88" citizens'-veto campaign to nullify driver's cards for illegal aliens, was most impressed with the urgency many of his late-responding fellow citizens exhibited over getting their signatures in by the July 6th deadline. "On the steps at the state capitol Friday we had state employees come out to us to sign. We had truck drivers who were servicing the building sign. We had state police sign," he said. "There were people driving 60 miles each way to drop off one-line signature sheets." "I wish everyone could see how frantic some registered voters were to get their signatures counted so that IP 22 will get on the ballot," Jim added. "There's a sense that ordinary folks are beginning to grasp what the future will be if we don't push back effectively. They know this country is at a tipping point. A lot of these people have been sitting on the sidelines, intimidated about being called 'racist.' The usual ..."
Indeed, there was active intimidation that affected how voters' signatures were obtained. Jim explained that more than 100,000 of the signatures OFIR collected were gathered by volunteers with clipboards or by people downloading single-signature petition forms from the web and mailing them in (or making a last-minute drive to the capitol in Salem!). Meanwhile, fewer than 10,000 signatures resulted from the work of paid signature-collectors because, Jim explained, the best venue for that activity is metro Portland, "where it became exceedingly nasty to collect signatures, especially for women." Jim is quite optimistic that the 110,445 signatures OFIR submitted will yield the needed 88,184 valid signatures. That would require an 80-percent validity rate, well below the 93-percent validity rate OFIR achieved in the signature-gathering stage of 2014's "NO on 88" campaign. Nevertheless, he and the others in OFIR's battle-tested crew must wait, nervously, to hear from Secretary of State Dennis Richardson. It's fortunate that they're battle-tested, as Jim expects that "The other side is about to pull out every dirty trick in the book." The dirty tricks will presumably be the work of "Oregonians united against profiling," an umbrella organization established on July 6th, according to an email forwarded to me. With their name presumably also announcing their approach, we can expect a campaign of distortion along the lines of that in 2010 associated with Arizona's SB 1070 law of phony "Papers, please! "-hysteria fame. The groups behind the effort to throw out Oregon’s existing Sanctuary law are Oregonians for Immigration Reform (OFIR) and the Federation of Immigration Reform (FAIR). Both groups have been designated extremist hate groups by the Southern Poverty Law Center. Going to the link they provide lands you on a typical SPLC point-and-splutter page. Meanwhile, assuming the signature-gathering campaign has succeeded, IP 22 will apparently be the only statewide immigration-related ballot measure in the country this fall. Immigration patriots nationwide can keep tabs on the campaign via the OFIR website and the related Stop Oregon Sanctuaries website. The SPLC File - An Exclusive Report on the Southern Poverty Law Center, The Social Contract, Spring, 2018. YouGov has conducted an estensive survey on opinions of immigration, political parties, and other issues. View the YouGov survey. SACRAMENTO, Calif. (AP) — California Gov. Jerry Brown signed “sanctuary state” legislation Thursday that extends protections for immigrants living in the United States illegally — a move that gives the nation’s most populous state another tool to fight President Donald Trump. “These are uncertain times for undocumented Californians and their families... bringing a measure of comfort to those families who are now living in fear every day,” Brown said in statement. The Trump administration said the bill will make California more dangerous. The state “has now codified a commitment to returning criminal aliens back onto our streets, which undermines public safety, national security, and law enforcement,” Devin O’Malley, a spokesman for the U.S. Department of Justice, said in a statement. De Leon’s bill cleared the Legislature with support only from Democrats. Republicans said it will protect criminals and make it harder for law enforcement to keep people safe. The group shouted down Rep. Pelosi, who struggled to maintain control of the meeting, and unfurled a large banner calling for all illegal aliens to be legalized. Others held up signs, including: “Fight 4 All 11 Million,” referring to the estimated total of all illegal aliens in the U.S.
We remember all too well how for eight years the Democrats laid siege to our communities, raiding and deporting nearly three million people, of our family members and loved ones. Where was your resistance then? Ms. Pelosi, did you think we would forget? We send a clear message to our fellow undocumented youth and community: We are the resistance to Trump! Not the Democrats! The activists also chanted “Brown power!” In a show of “intersectionality” — solidarity among left-wing groups — they also chanted “Trans lives matter!” and other slogans, while Pelosi stood silently behind the throng. “You met with Trump, and you call that resistance?” they shouted in unison. Earlier, Pelosi had spoken at the podium with community leaders and fellow members of Congress from the Bay Area in support of her legislative push for a bill that would legalize the Deferred Action for Childhood Arrivals (DACA) program. “We’re not giving up our fight to protect America’s dreamers,” she said. However, she could not speak over the protests. “It’s clear you don’t want any answers,” she said. As if to support her point, activists chanted: “All of us — or none of us,” meaning that they would only accept full amnesty for all illegal aliens, not just DACA beneficiaries.